A lot of things have happened since August. Two particular things of note have been seminars and maker faire (oh, and NHK filming, but more news about that’ll come out in a few months). I was going to write blog posts on these topics, but then I realized to explain the history of the seminars, I would need to dig deeper into the past. To clarify why I’m writing this blog post, I’m currently the president of MITERS, but not for much longer, and I want to record my thoughts. Officers are elected in the spring term to provide continuity from one “generation” of officers to the next, so the outgoing officers, if they are seniors, have a chance to relay their knowledge. So I’ve been president since last February, and my term is coming to a close soon. MITERS draws people in because of our fun / crazy projects. We are a student group promoting making things for the fun of it. Hold on. Wait. There’s a prequel to explain how, exactly, a seminar series fits this vision. In late December of the previous term (when muffin was president :D), I’d sent out this survey to all the MIT dorms. My goals as president came almost directly from insights gleaned from that survey. Like the seminars, the issue of how MITERS is perceived is a subject near and dear to my heart. I first heard about MITERS when I was a wee prefrosh at CPW. I’d heard about LED’d prom dresses and decided I wanted to do that too, but I didn’t have LEDs and I didn’t know how to turn them on. I asked my host where I could find them, and that’s how I first came to MITERS. Thanks so much, I was able to swing by and grab a lot of LEDs. Err, like 12. It was sort of awkward b/c I just randomly dropped in, and I left before saying thanks .__. 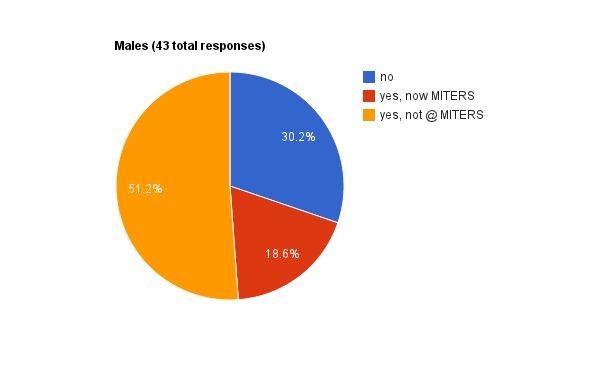 If you see any MITERS people, please tell them the random prefrosh said thanks a lot! And that I’ll return the favor in half a year or so. Muffin was the first person I talked to at MITERS, I think. He attempted to show me how an LED worked, but the battery was dead. I forgot what else happened, but I left shortly thereafter. (also, I didn’t figure out / have enough time to LED my prom dress ~__~). Also, holy crap, 2011. That was last year. o___o?! Well, to be fair I’d been filling out forms for MITERS for a while before then. Where was I going with this? Right. I definitely found MITERS pretty intimidating and informally felt that many people felt the same way. So I did the survey thing! There was interesting data even if it’s likely in that so-unscientific-it’s-worse-than-not-doing-a-survey range of misleading. 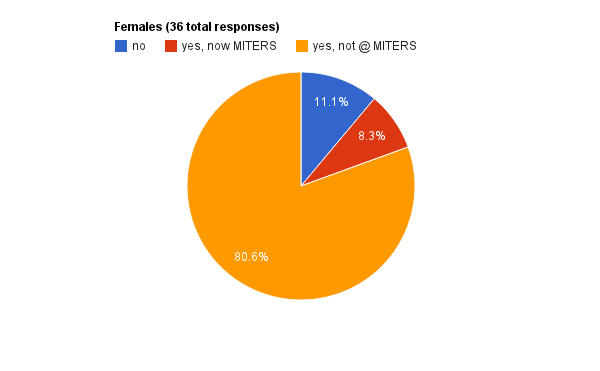 Here are the results from the main question in the survey. Were you ever intimidated by MITERS? 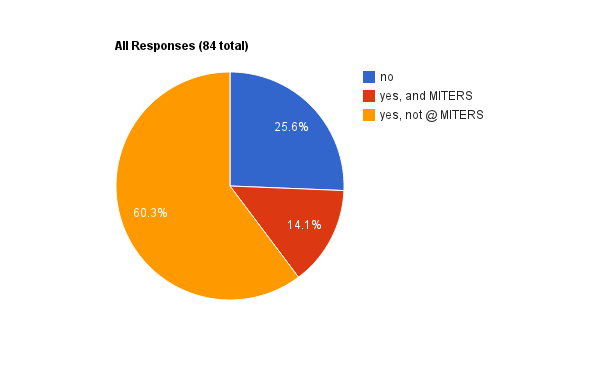 Conclusion: A lot of people (who have heard of MITERS and responded to this survey) find MITERS intimidating. And it does appear that females are more likely to be intimidated than males. I also found the answers to the “what else” question quite elucidating. They form the main basis for what I aimed to achieve as president. ~ i was just sort of intimidated at the beginning of the year. in general, I was asking around if I could help with projects or get some help starting mine. however the response I was getting was generally that I should start my own project, which is sort of intimidating for a freshman with limited design experience. ~ Mostly it just wasn’t super welcoming – walking in you’re mostly ignored which can be intimidating for a new person. Its totally fine now that I know some people though. ~ I’ve gone to MITERS before, and sort of been at a loss for what to do. Not intimated, per se, but just sort of confused. *I’m doing this unethical thing where I said I’d only quote people to keyholders, but I’m making the executive judgment that it’s been sufficiently long ago and the answers completely devoid of identifying information that a few quotes will be a-okay. Neglecting whether we should INVITE ALL THE EVERYONE EVER to already-extremely-disorganized thing that is MITERS, I, from my own personal agenda, was all I FEEL FOR YOU ALSO I’M GLAD I’M NOT THE ONLY ONE. 😀 So then I dragged the rest of MITERS along. Okay I am getting more sleep-deprived as I write this post. The main conclusion was that build parties were not really helping new people feel more comfortable at MITERS. At a general meeting, we decided that we should revamp build parties and try to make them more welcoming, for instance by having a kit project that seedlings could work on and having an group introduction sometime during the night so that people could get a better sense of what was going on at MITERS. In late May I did a recap of things I wanted to happen during fall term. 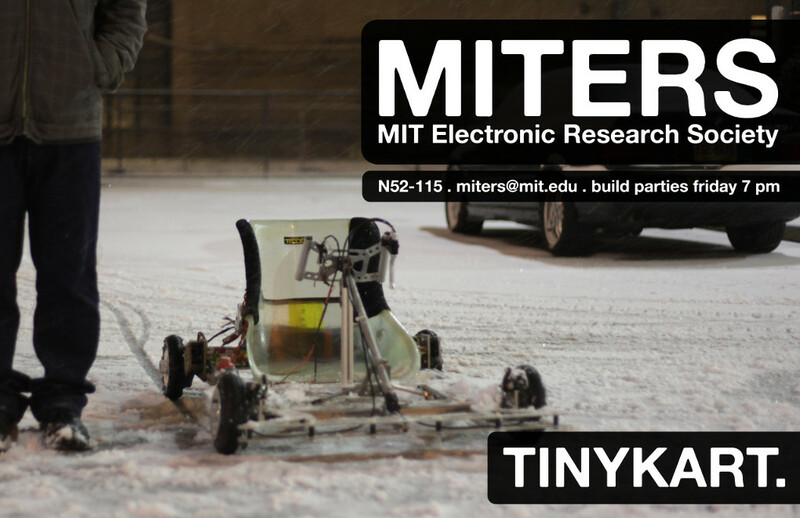 Encourage more individual crazy / fun projects at MIT. The basic idea was that we wanted to make sure people who wanted to come weren’t prevented by being intimidated, and professors and administration better knew what we stood for. 1) The project grants worked out o.k. We kept it to non-MITERS people. Mostly the grantees got hosed and didn’t finish their projects, and/or only came to MITERS to pick up their parts. 2) The posters worked out great. Alex postered and then we forgot about it. X___x i should get that going again this semester. yay thanks timyang and atw. So, finally we come to the topic of seminars. Of course now I am tired and so the part about seminars will actually be really brief. I started them last semester, a bit informally. They were relatively sparsely attended and were just random topics people volunteered to talk about. This semester, we actually organized a series of topics. Actually, this post began as “I should share the picture I took of the seminars!” And so, finally, we are here. Seminar 1: 555s! We had people make blinky LED circuits on a breadboard. I taught the first seminar, and Peter helped actually make it not fail. A closeup of a circuit-in-progress. Seminar 2: 555s again. Bayley taught it this time around. Ah, debugging. The greatest of skills. Seminar 3: Solidworks 1 (parts). Charles taught this using his 2.007 TA experiences. They modeled motors and learned to use calipers as well. Charles: If there are any blue lines (unfixed dimensions), I will give you zero points. Seminar 4: Solidworks 2 (assemblies). Charles taught this too. The next one (today) will be taught by Dane and will involve routing and ordering boards. We’ll actually be combining all the boards people make into one board and ordering them thanks to support from advanced circuits. don’t forget, 555s can run off of battery packs. for a long time i was trying to figure out how to run power lines from power supplies to dozens of people… derp. Yay! That’s it for now. The next installment will most likely cover our trip to Maker Faire NYC. Actually, this has been covered by expert bloggers Shane and Charles already, so I might not write this post. *scratches head* Otherwise, I might just do biweekly updates on the happenings at MITERS. Like swapfest parrots. Author nouyangPosted on November 2, 2012 December 2, 2016 Categories Uncategorized2 Comments on What is a MITERS?